Nottingham Forest have distanced themselves from rumours linking them with a move for former captain Chris Bart-Williams. 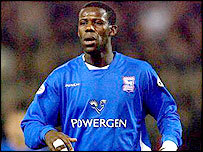 Bart-Williams played more than 200 games for Forest between 1995 and 2002 before leaving for Charlton on a free. The 30-year-old is without a club after being released by Ipswich at the end of last season. "We were contacted by Chris' agent but Joe Kinnear isn't interested in signing him," said chief executive Mark Arthur.